Looking for an economical alternative to rags? Try TIDDOX’s absorbent industrial wiper rolls, especially designed to replace traditional bags of rags and cloth towels! These heavy duty, strong, absorbent, 3-ply industrial paper rolls have replaced rags in factories, garages and automotive workshops. A cost effective, disposable industrial wiper for general wiping tasks such as cleaning or drying hands, tools, equipment or soaking up spills of viscose liquids, including solvents, lubricants, oils, grease and dirt. Their noticeable thickness and high wet strength are attributable to the manufacturing process of gluing together 3 plys of mixed cellulose tissue and embossing the glued layers to improve tensile strength and increase absorbency. The result is an effective industrial towel that provides an efficient wiping experience! In addition to its high absorbency capacity, the low lint and non-scratch features of these disposable paper wipes lend this product to delicate polishing applications, and cleaning sensitive equipment parts. These industrial wipers serve a multitude of purposes. The busier your spaces are, the more towels your workers will go through. That’s why it’s so important to have an affordable paper towel for their use. If the paper is strong enough, it might even be used in place of other cloths! Wouldn’t that be great – to have a multipurpose towel that will stand up to tough use? Well, TIDDOX has just that very product. It’s our JUMBO PAPER TOWEL ROLL. The sheets are perforated every 35cm (36.5cm width) for easy removal from the roll. Each sheet is 3-plys thick, glued and embossed to make them strong enough for the job. These paper towels stay strong when they get wet, so they can be used with solvents to scrub up stains and messes. They are strong enough to be used to clean factory equipment, hand tools, and work surfaces. They are also absorbent enough to clean up spills without smearing the liquid or gel all over the place. A hydraulic leak on a machine is no problem – just drop one of our industrial paper towels on the spot, and it will continue to soak up the drips until someone can get back to it. Polish surfaces, clean work areas, and scrub oil and grease off of your machinery and tools. 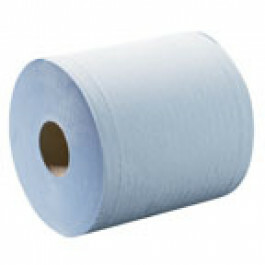 So if you are in either the manufacturing, automotive, printing or similar industry and you require a high usage, heavy duty industrial paper towel at an affordable price, we highly recommend these premium disposable blue paper towels. Portable floor stands are also available for use with this product, so that these disposable towels are always handy. For thicker, stronger material than 3-ply paper tissue, you may wish to consider the following products from TIDDOX's range of jumbo industrial rolls, namely the JUMBO RHINO ROLL (BLUE), or the JUMBO CLASSIC ROLL (GREEN) . All jumbo rolls fit our JUMBO ROLL FLOOR DISPENSER.